As the Holy See remains open for business on Saturdays, weekend news is always a possibility on the beat... and true to form, a move announced this morning will likely garner no shortage of reaction in church circles, and from all sides at that. Earlier today, B16 named the church's "chief justice" Archbishop Raymond Burke to the membership of the Congregation for Bishops, giving the 61 year-old prelate a seat at the dicastery's all-important Thursday Table, whose votes recommend prospective appointees to the Pope. As a result, Burke's impact on the process and its outcomes could extend for two decades; normally renewed on a five-yearly basis, Curial memberships automatically cease at age 80 both for bishops and the college of cardinals, which the Wisconsin-born prefect of the Apostolic Signatura is likely to join at the next consistory, currently expected to take place sometime in mid-2010. Best known for his oft-controversial commentary on public life, the naming of the former St Louis archbishop gives the US its fifth seat on the 30-member A-list group, joining Cardinals Bernard Law (archpriest of St Mary Major), William Levada (prefect of CDF), Francis Stafford (retired Major Penitentiary) and Philadelphia's Justin Rigali, a former #2 at Bishops who's become the Stateside hierarchy's standout kingmaker since his appointment to the congregation in September 2007. While Burke is the youngest US member the congregation's seen since Law's arrival at the peak of his clout in the early 1990s, its most youthful American until today was Levada, 73; Stafford and Law are both 77, and Rigali turns 75 next April. 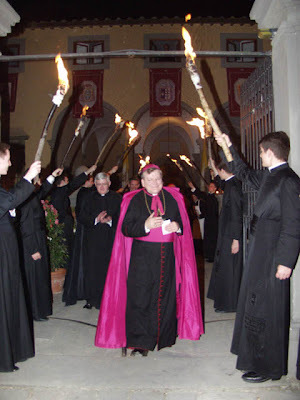 By custom, the heads of both the Signatura and the Apostolic Penitentiary (the top tribunal for matters pertaining to the internal forum) each hold a seat on Bishops. Though it can only be gauged with time, the emergence of a potential -- and potentially significant -- "Burke effect" on Stateside appointments bears watching. Since Rigali's return to the table, the congregation's American choices have trended heavily toward pastoral, conciliatory candidates whose ideological leanings have proven tough to read. Along these lines, the recent picks have mostly shown little inclination to enforce Burke's reading of Canon 915, whose preclusion from Communion of anyone "obstinately persevering in manifest grave sin" would, in the prefect's clearly and frequently articulated judgment, see the Eucharist denied to Catholic politicians who defy church teaching on abortion. While last spring's selection of Archbishop Robert Carlson as Burke's St Louis successor can easily be viewed among said bunch, the new prelate-maker's penchant for unstinting fidelity with a taste for stoking public debate was reflected in at least one recent high-profile pick: Oakland Bishop Salvatore Cordileone, a protege of Burke's who was named to head the northern California diocese in March. Again, whether the presence of the sanctions' first and most prominent advocate will lead to a shift won't become clear for some time. In the meanwhile, though, it makes a process that's lately become far more complex all the more interesting. Also named to Bishops this morning was the Vatican's "Worship Czar," the Spanish Cardinal Antonio Cañizares Llovera, whose longstanding ties to Pope Benedict have seen him dubbed the Ratzingerino, or "Little Ratzinger." Tomorrow morning, Burke will offer a Pontifical High Mass in the Roman rite's "extraordinary form" in St Peter's Basilica. The celebration with the 1962 Missal -- a cherished cause of the archbishop's -- is believed to be the first public use of the pre-Conciliar Mass at the Vatican since the liturgical reform was implemented in 1969.